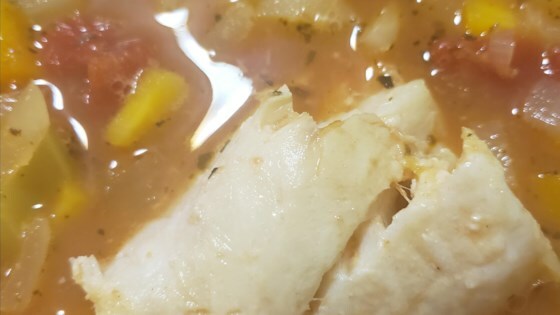 "Hearty and delicious soup. You can poach cod, haddock, flounder, and salmon. I love to serve this on a cold winter day. For a stew-like consistency, simmer for longer. You can serve the stew over rice if desired." Melt butter in a 5- to 6-quart pot over medium heat. Add onion, celery, and carrot; saute until tender, about 5 minutes. Pour in chicken broth, tomatoes, wine, and lemon juice. Bring to a boil. Add tilapia, herbs, salt, and pepper. Reduce heat, cover pot partially, and simmer until tilapia starts to flake, about 10 minutes. Transfer tilapia to a plate and cover to keep warm. Simmer cooking liquid until slightly thickened, 10 to 15 minutes. Return tilapia to the pot and heat through, 1 to 2 minutes. Make a simple, delicious white fish stew with leeks, fennel, and potatoes. You can use olive oil or vegetable oil instead of butter. You need 4 cups liquid. Use chicken broth, vegetable, or water as needed. Substitute 1/4 to 1/3 chopped fresh parsley, oregano, and/or basil for the dried Italian herbs, if desired. I made it with cod. It was very tasty and easy to put together. Made it with cod and added parsnips as well as carrots.